Why aren’t used banners recycled? Every year millions of banners are printed, used for a period and then discarded, filling landfills with millions of cubic feet of waste. Recycling has taken hold in virtually every other area of industrial and consumer waste – so why not in the banner industry? Let’s talk about the factors that are NOT responsible for this wasteful practice. It is NOT because people in the banner industry are lazy, wasteful, or unconcerned. It is NOT because they are greedy and unwilling to invest in solutions. It is NOT because the buyers of banners are unwilling to pay a few extra cents to make recycling of banners a reality. No, these common misconceptions are NOT the reason banners are not recycled. People in the graphics and advertising industry are as concerned as society as a whole about the waste and inefficiency of trashing plastics. So, why hasn’t it happened? The reason is systematic. Because of the unique challenge of banner production and distribution, the systems that work well for recycling of other polymers doesn’t fit the banner market. 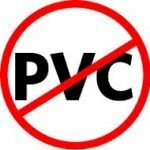 For instance, banners are made of a variety of polymers, the most common of which, reinforced PVC (scrim banner media)has been called the “poison plastic” by environmental groups due to the environmental effect of its production, use and disposal. Moreover, while pop cans and laundry detergent jugs can easily be labeled and separated according to their polymer type, banners are by nature a mixed waste of vinyl film and polyester scrim. Some creative suppliers have developed processes to recycle separate and reuse the PVC in production of secondary grade new films. Many have also developed new uses for old banners. Unfortunately, the supply is so much greater than demand that some suppliers are simply not taking any new waste. But even if they were, one problem remains – grommets. 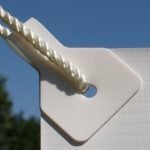 Those little brass eyelets placed all along the hem of each banner for tie off points must be removed at a cost that is usually impractical. But even if you do remove the grommets, what do you do with the waste? You can’t put it out in your curb recycling can, and finding a buyer for large volumes is difficult even if you can collect it all. For these reasons and more the banner industry has never been able to scale the mountain of banner recycling waste. 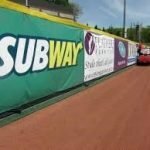 Recyclable polyolefin banner media such as poly propylene and polyethylene have been growing in use for years – first in the billboard industry and now in banners, due to their high strength, light weight and low cost. Industry leaders such as HP are leading the charge in the area of banner media production. 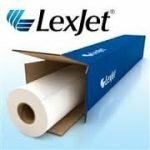 One progressive media suppler, LexJet has even created a fully integrated recycling process that includes a buyer of the waste. The only missing link has been a large scale grommet-free production method – until now. Banner Ups products are a system of banner finishing that eliminates the need for grommets. Banner Ups are pressure sensitive adhesive grommets tabs which take the place of grommets. 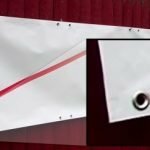 Because they spread the force over a much larger area than grommets, Banner Ups are stronger and much more resistant to tearing out – a perennial problem for grommets. When tabs are combined with Banner Ups PowerTape hem reinforcing tape, banners can be made extremely strong. Wind tunnel tests have shown Banner Ups banners can withstand winds up to 90+mph. BannerUps have been successfully marketed for 25 years to banner makers who manually apply the products. But now Banner Ups has introduced the BravoBanner automated banner finishing machine that can automatically finish high banner volumes at a low cost. This holds the promise of closing the loop to make recycling of banner on a mass scale not only possible, but attractive to the ones who drive all this – national advertisers. Many of these companies are under corporate environmental sustainability mandates to reduce waste but are stymied in the area of banner recycling. Imagine this. Instead of asking printers (who have no economic motivation for sustainability) to increase their cost with recyclable materials, suppose the Nikes, Walmarts, and Exxons of the world were approached with a solution to their banner sustainability problem? These global corporate citizens can now be presented with a real way to achieve banner sustainability, a goal they truly want to achieve. They can be shown sustainable banner media (such as HP media) and finishing materials (such as Banner Ups), and be directed to a BravoBanner-ready printer who can finish recyclable banners in high volumes at a low cost. Perhaps there could even be a marketing benefit in incorporating the recyclability into the banner art! Finally, they can be linked to a high volume waste consumer as LexJet has done, and the loop is complete.Banners can be specified by national advertisers that are not only cost effective, but sustainably produced and actually recycled. Everybody wins. Banner recycling on a large scale is now possible. Why aren’t used banners recycled? Using the latest technology and a little bit of creativity, this may soon be an obsolete question.